Hello to everybody, long time lurker, first time poster etc. First, i guess thanks are in order for the wonderful job that has been done on this mod. There's something that's been bugging me to no end, it's the way gunfire suppression works in JA2 1.13, well JA2 in general actually. It's too easy and too damn efficient. 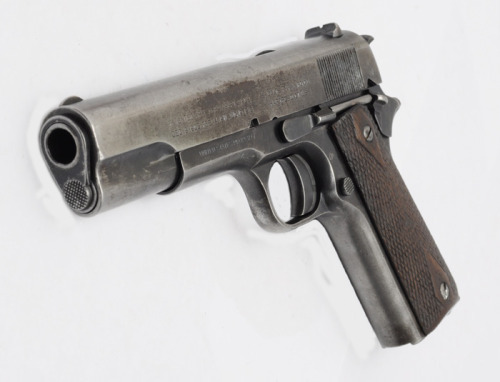 Here's your old pal, Mr. 1911. Notice that there's nowhere you could screw a suppressor on. Actually, you would need to take it apart, buy a drop-in threaded barrel such as this one before you could attach anything on the muzzle. If your gun already has a barrel extending out of the frame, say a Beretta 92 or a rifle, you could go on threading the barrel without having to replace it, although I can see ways to implement drop-in barrels in NAS, I do not see how one would go about threading a barrel short of item merges. The game uses a linear scale to measure loudness of gunfire whereas all the measurements I could find when I was doing some research on suppressors was on the decibel scale which is base 10 logarithmic. I figure the loudness of a gun in game is the distance in M it is heard at. The figures are such: In game a suppressor reduces gunfire loudness by 75%. In real life, a suppressor would reduce the sound pressure generated by gunfire by something about 99.95%. Wait a minute! That's like very very effective, I thought you were saying the suppressors in JA2 were too efficient! here's a table of sound pressure relative to the decibel scale on wikipedia. It even has some firearms on it. It's quite handy as you can hear both subsonic and supersonic in the same weapon and filmed with the same camera. The game has cold loaded ammunition in some calibers but it works by reducing linearly the loudness of the shot when it should actually report a loud sound on it's path until it slows down and drops. There's a statistic in the XML properties of the guns in the game that could be used to at least report a supersonic ballistic crack where the gun is shot: it's the animation speed of the bullet. It would make sense as the bullets would go twice as fast out of a P90 than a MP5k anyway. So I figure the gunshot should not report one but two sounds: The firing of the gun, and the ballistic crack or lack of it. Optionally the ballistic crack could be reported along the trajectory of the bullet but I figure it would screw too much with the AI. Gameplay wise, this means that the more modern PDW calibers such as 5.7*28mm wouldn't be so overpowered compared to the early game 9mm, .40S&W. and .45ACP. Heavy subsonic calibers such as the 9*39mm or .300 Whisper would make more sense as well. Moreover, heavy subsonic ammunition has lower recoil, and makes up in autofire accuracy what it lacks in range and penetration, giving a wider choice on how one equips his mercs. Some cold loaded ammo would fail to cycle the action of a rifle though and would require manual cycling, but that sounds hard to implement. In conclusion. Even though all of these changes could be implemented independently, having all of them in could mean that the mechanics dealing with gunfire suppression would shift away from the Hollywood implementation where guns with silencers go *phew* to a realistic implementation that would actually make the gameplay even richer. I do wonder however if I may have overlooked some facts on this as I have very limited first hand experience with guns, as I live in a country where they are banned (suppressors do sell over the counter here, ironically). Besides, I understand that having drop in barrels as (default) attachments implies that most gun internals, at least for pistols would be replaceable from default attachments to fancier components, match grade parts, heavy duty parts, etc. EDIT: forgot about cold loaded ammunition not cycling the action of a gun. Total agree but it's a bit of a work. I noticed what you mentioned above as well by working on my sound project. This was mentioned last week as well. Would be nice. Could this not be done simply by having cold ammo reduce the reliablity of the firearm by something like 5? This would cause it to jam more often. Or am I misunderstanding the reliability value? Hi DInfiltrator, Welcome to the board!! Previous Topic: 9x39 OC-14 incredibly loud?